“Hawkeye” is a desktop software application, and we are considering creating an online version. It displays maps and data related to road traffic networks collected from camera and lasers on a vehicle. You could imagine this to be a more complex version of Google Maps + StreetView, but with a wider range of information available. • imagery for assessment road parameters (i.e. how tall is the street sign, how wide is a road). This information is important for managers responsible for maintaining the condition of the roads, and their safety, while ensuring the best use of funding. Would appreciate if you rate #105. Thanks! Hi! Pls rate #79. Thx! #60 & #61 & #62 & #63 & #64 | Please leave feedback to all. Thanks sir. From what i've seen so far.... 'Hawkeye Insight' recognises that the website can provide more detailed information about the road network so i like that. 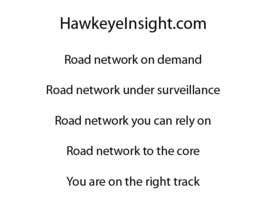 'Hawkeye Horizons' shows that we cover the road network as far as the eye can see, so i like that aspect too. I must maintain the term Hawkeye in the name. 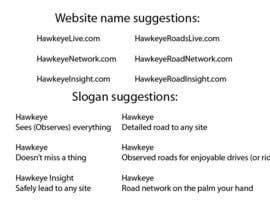 I liked HawkeyeInsight a bit as it is a single word, feels like its in the right direction to me - that kind of thing. Please see entry #15 also, I am good in graphics but also in advertisement copyright. Thank You! Please see entry #10 . I can develop this idea for graphic design. Thank You !